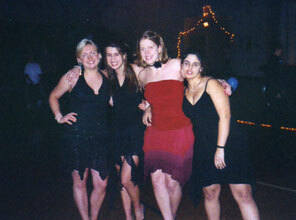 Wiebke and some of her foreign exchange friends in Michigan. 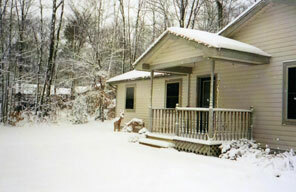 This is Wiebke's host family's home in Michigan. Michigan normally gets a lot of snow in the winter. Wiebke Jakob is a student from Gymnasium Wandlitz in Germany who has had many connections with Silver International. She has written many things for Silver International and she and her parents came to visit the Silver International staff during a summer vacation. This is her story about her experience in Michigan this school year. The American Dream - I had wanted to live it for a very long time. Going to school in the USA, staying with a host family, making lots of new friends, and learning the language were the reasons why I wanted to become an exchange student.My organization ASSE sent me to Traverse City, Michigan, a little town near Lake Michigan. I like Traverse City. It has beautiful restaurants and shops, and Lake Michigan is just so amazing. Its deep blue water seems like an endless ocean. What I don’t like about Northern Michigan is definitely the weather. The winter was long and very cold, with lots of snow (and many days of no school, too). The area here looks a lot different from Germany. There are lots of wide open spaces. The houses look like they will fall apart whenever a strong wind blows... And the cars are much bigger. Here everybody has a truck. Nobody could afford that in Germany because the price for gas is six times higher than here. Here I go to a high school with 1400 students. It’s quite a big school. Seventeen other exchange students go there. School is different from Germany, too. I only have six classes (at home I have at least 10). You have to turn in every single worksheet and every homework assignment. They almost count more than tests. In Germany tests count 90% of your grade. I ran cross country in the beginning of the year. Now I’m on the track team. That’s how I got to know lots of people. But I’ve experienced that the word “friend” means something different here. For some people just saying “Hi!” in the hallway already means you’re their friend. I took some time to get used to that. For exchange students, living with host families can be a little weird at times. Sometimes it’s hard to talk to them, so that means I don’t have an adult at home that I can trust. An Italian boy and a French boy stayed with my host family, too, during the first three months here. But they switched to other host families because they didn’t get along with my host family at all. I have to take care of the three dogs and three cats... My host family is certainly not perfect, but where on earth can you find a “perfect” family? There is no such thing. I got the chance to see Chicago twice. It’s an awesome city. I just loved it. There’s so much diversity there. The architecture is very impressing, and the shops are just amazing. Since I’ve been here I’ve learned so much - not only about myself, but also about all kinds of people. I met lots of exchange students from all over the world. That was a very good opportunity to get to know things about other cultures, too. I made friends with so many people. I’ll be going back home to Germany on June 15. It’s been a year full of adventure and new things. I’m glad and proud of myself that I’ve made it through most of my time here.